Inspired by a real arrowhead hunt earlier in the summer, about four families came out for a crawdad and arrowhead hunt designed specifically for younger children in Forest Park. The “River des Peres” was diverted shortly after the World’s Fair in 1904, and now runs beneath Forest Park; it runs south and empties out into the Mississippi River, and, like many of our rivers, currently functions as a combined storm water and sewage drain. The “river” that now flows through Forest Park as part of the restoration effort is basically tap water from the city water supply, making it suitable for exploration by small children. 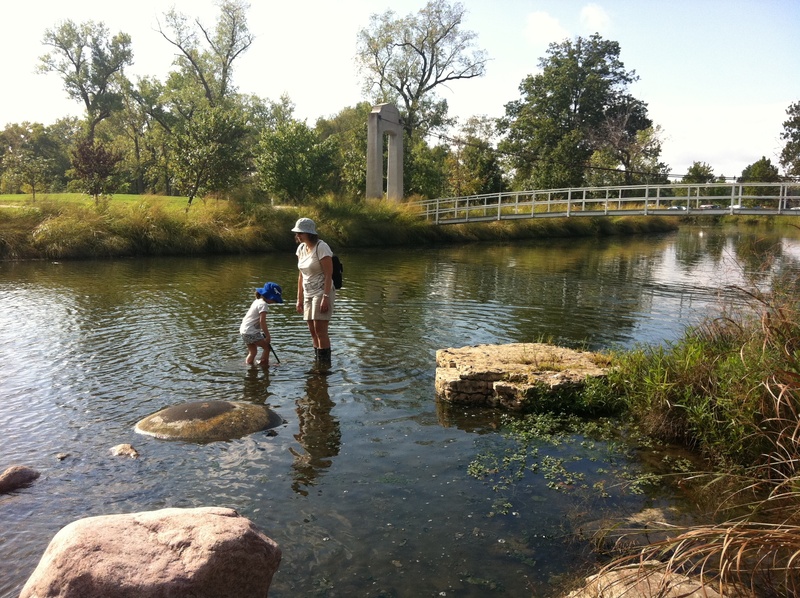 Swimming in Forest Park is prohibited for obvious reasons, but wading into the water is a bit of a question mark; I think most forest rangers would agree with the Green Spiral philosophy that we need to find a ways to let children touch a river before they grow up. The River des Peres, from our rich french heritage meaning “River of the Fathers”, is a particularly fitting setting for this type of adventure, as Dads are especially good at catching crawdad after crawdad. If you’ve read “Last Child in the Woods” you know that without frequent outdoor experiences, children are likely to grow up to be fearful of nature. Adults light up when provoked by memories of catching crawdads, but it’s hard to find many kids at all who are comfortable picking up, much less catching crawdads these days. On our field trip, we made crawdad catchers from paper clips, plus we caught crawdads by hand, putting them into a bucket for closer observation. One five-year-old, Clara, fearlessly plunged her hand into the bucket and pulled out a squirming crawdad. Surprised, I asked her mother how she knew to do that, and the answer came back describing how the fishermen in Scotland taught little Clara to do it with lobsters! Green Spiral families are adventurous people, and I am always pleasantly surprised to see them show up with things like river gear, hats, buckets and nets. Later, we hid arrowheads, like easter eggs, to include two other families that showed up. The arrowheads were not easy to find, yet the kids were persistent in their hunting until they were greeted with success. Along with developing a host of abilities, such as visual discrimination skills, real-life outdoor experiences are an easy way to stretch a child’s ability to persevere through difficult circumstances. Green Spiral families tend understand the importance of developing persistence and resilience in children, and there’s no better classroom for that than the great outdoors. What you can do: Go crawdad catching with kids and friends! You can read how to make a simple crawdad catcher out of paper clips and string in earlier posts. Find a centrally located clean stream suitable for small children and share it under the “comments” section for future Green Spiral field trips. Locate restaurants that serve crayfish on the menu and ask them where their food comes from. Champion the many organizations who are working hard to restore our waterways to good health. I went to scout out what I would call “Paddle Day” at Riverlands, the new Audubon Migratory Bird Center located near Alton. ‘Big Muddy,’ another Saint Louis outfitter was there, along with the Alpine Shop, and virtually every non-profit that has anything to do with rivers. The US Fish and Wildlife Department was there with a box of interesting turtles, the Lewis and Clark re-enactors were there with period costumes, weapons and elk stew made in a cast iron pot; the US Army Corps of Engineers was there with a replica of the river on a table in a trailer. Plus, there were geocaching activities, maps, treats and give-aways of all kinds. This event was part of a federally funded program designed to encourage people, especially families, to be active and get outdoors. 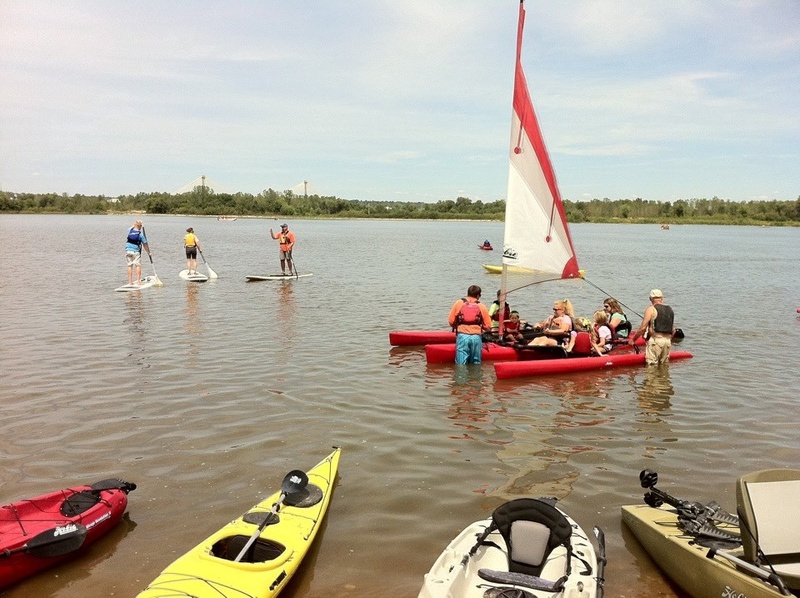 The theme this year was ‘connecting with rivers and waterways’ and the whole program is called “Summer of Paddling;” it includes a series of paddle events up and down the length of the Mississippi River thanks to large and small collaborations between non-profits, government agencies and small businesses. I have heard that next year the theme will be bicycling. Here’s the official link to “Summer of Paddling;” in all honesty it took me a fair amount of work, and a lot of question asking, to figure out exactly what “Paddle Day” was about, so I’ve tried to describe it in this blog as clearly as possible. I thought the timing was good, as school had just started, and sports had not yet called families to the ball fields for Saturday games. It was a glorious day, and mid-August is a good time to play with water, and not let go of summer just quite yet. THIS IS EXACTLY THE KIND OF THING WE NEED TO HELP NURTURE ALONG THE FAMILY-NATURE CONNECTION! Sorry, I typically don’t shout, but again, it was simply AMAZING! I regret I didn’t take any pictures; if I did, you would see that attendance was very light. In fairness, you need hundreds if not thousands of families to fill up great nature spaces, but still, the event was definitely not overflowing with people, which was good, because you could easily get on any paddle toy without waiting. I have written all over the Facebook Pages of every ‘Paddle Day’ organization I could find, encouraging them to please, please repeat this event next year. Like Earth Day, it will grow and people will come. One intriguing thing I learned about was the Mississippi River Water Trail: it’s like a hiking map, except for kayaks and canoes. If you are an experienced paddler, you are familiar with them. The idea is to create a national trail we can all use and be proud of, like the Appalachian Trail. Our rivers define us here in Saint Louis especially, and we are right to be proud of them. I’ll be monitoring this event for next year, and if it comes up over the horizon, you can be sure that I’ll give you a shout out via social media, and push it via the Green Spiral newsletter. Until then, there’s still time to get out and paddle around before winter sets in! Family reunions call for equitable activities, meaning free activities, and nature is able to answer that call. My mother called a family reunion, so we ventured down to the river, all 22 of us, plus a dog, in search of arrowheads and other treasures. We had very young children and princesses in tow, along with several kids who don’t like to unplug for long. There was a moment of trepidation at the river’s edge, and then, in one glorious movement, everyone entered the shallow river, skipping rocks, flipping shells, happily exploring the river and it’s many wonders. Nature is the great equalizer and the great individualizer: we each found something unique, and completely compelling to do, to the point of ignoring the first pouring rain in a 90-day drought. Watch the way children play outdoors very carefully, it’s easier to discern their learning modalities outdoors than it is indoors. For example, if they are visual learners, they will be the first kids to spy the fish bones, or arrowheads. If they are auditory learners, they will be the first to hear the airplane overhead. When visiting a river with extended family, always bring paperclips with you, for with paperclips, you can make “crawdad catchers’ and keep everyone entertained for hours. To make a “crawdad catcher” simply unfold a paperclip into the shape of a fishhook, tie a piece string to it, and fix a bit of meat to it. Teenagers and toddlers alike can safely “fish” for crawdads, who pinch the meat with their claws and won’t let go, even when you lift them out of the water to watch their spiny legs claw frantically at thin air. The proper name for crawdad is crayfish, and surprisingly, Missouri is a biodiversity hotspot for them, largely due to our rivers, which are among the biggest and most beautiful spring-fed rivers in the world. Sadly, our rivers are under siege, from many point sources, including monster vehicles with enormous wheels, that crush delicate creatures in their wake. Who will speak for the truffulla trees and crawling things, if no one takes kids crawdad fishing? Take your kids “crawdad fishing” – and remember to bring your paper clips. Splash photos all over social media. Start a family nature club – and bring all your friends crawdad fishing. Make sure they bring their cameras. Find restaurants that serve crayfish and ask where the crayfish come from. 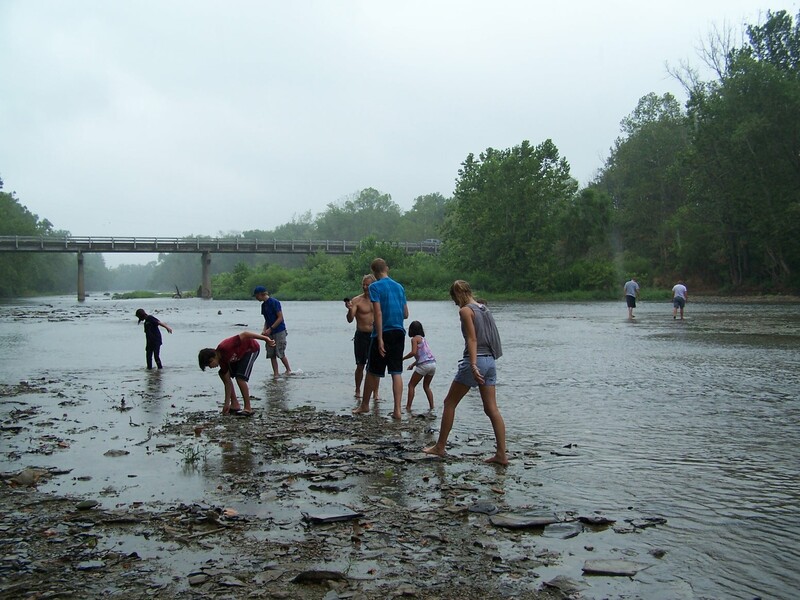 Join any number of worthy organizations, like Missouri Stream Team, and help clean up our rivers.